Coconut oil is the fat from coconuts, the fruit of the tropical coconut palm, Cocos nucifera. In the UK it is solid at room tmperature though it can melt on very hot days or in warm kitchens. 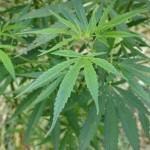 It is produced in a similar way to olive oil. As with olive oil there are various grades from the highest-quality, organic, extra-virgin, gently cold-pressed from the best and freshest coconuts to high-temperature extracted, highly-processed and refined oil extracted from coconuts of less good quality. 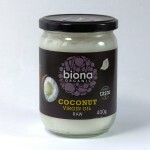 The aim of the best pure “virgin” coconut oil is to extract it in such a way that the oils are completely undamaged and unaltered by the extraction process which makes them a healthier food free from hydrogenation and trans-fats At room temperature coconut oil is a white solid, looking much like lard, but melts it easily to a pale straw coloured liquid. Raw virgin coconut oil melts at around 24 degrees centigrade; more refined or processed coconut oils melt at a slightly higher temperature. Raw virgin coconut oil is lightly fragrant with a slightly sweet and mild coconut taste; the more processed versions have almost no flavour or fragrance. It is normally bought in jars; to use it you either have to dig it out or melt it over a saucepan of warm water or in a microwave oven for a couple of minutes. Coconut oil is rich in medium chain saturated fatty acids. It is stable to heat and resistant to oxidation but should still be stored in a cool dark cupboard. 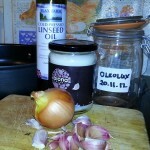 Coconut oil is used with linseed (flax) oil to make oleolux, an important constituent of the Budwig diet which is used as a seasoning, a dressing and for frying for the briefest time at the lowest temperatures. Coconut oil is the only other oil allowed on the Budwig Diet (apart from the occasional addition of a little pumpkin-seed oil to salads) so it is a beneficial source of calories. Coconut oil can be used to oil saucepans to fry very gently at the start of a dish. Normally fried foods are not recommended on the Budwig diet. For the Budwig diet you probably won’t want just any old coconut oil. 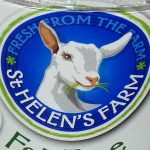 The cheaper ones in supermarkets have been processed at higher temperatures and refined, so they have lost much of their co-nutrients and delicate flavour in the process. The best coconut oil is raw, unheated, cold pressed/cold-extracted and unrefined “extra virgin” and preferably organic – really just fresh natural coconuts squeezed. Much of the coconut oil from supermarkets and ethnic shops isn’t the same thing at all. Natural raw coconut oil is delicious, it tastes sweet and only very mildly of coconut which makes oleolox a very versatile addition to your diet. 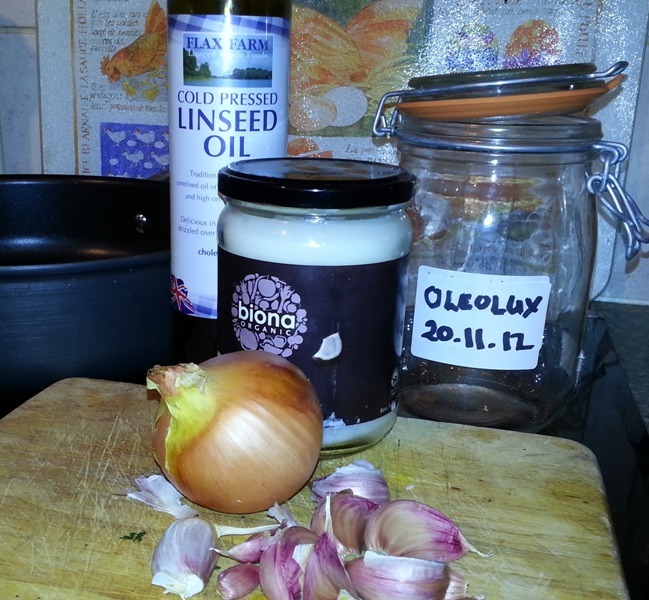 Oleolux contains cold-pressed linseed oil so shouldn’t be over heated: when heating do not heat for more than one minute to preserve the quality of the omega-3. Raw organic coconut oil is available from the Flax Farm Linseed Shop.